What the heck is the 5 minute chef? 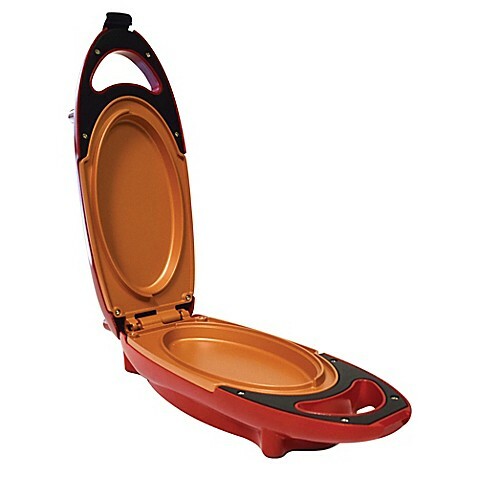 From a company best known for manufacturing cookware, they've release their own rendition of the portable electric griddle. Where it sets itself apart is in it's versatility. Most of the products of this type are used for making a few specific types of food. Maybe you're grilling a chicken breast, or toasting a sandwich. But with this unit, you can supposedly make almost anything from cake to burgers to biscuits. Sounds pretty unique, right? Well, I've got a bit of a confession to make. You ever see those infomercials at 2am? You ever think to yourself, "who the heck buys this stuff?" I buy that stuff. And I've had a few of these types of grills before. Five years ago, the idea was pretty unique. But today, there is LOTS of competition on the market. And often, you'll find yourself disappointed. There are a lot of products out there that simply cannot do what they say. Is the 5 minute chef one of those products, or is it going to set itself apart? To find out, we decided to try it out for ourselves. Can be used for gilling, baking, or roasting. Grill can be flipped over mid-way through, and comes with a recipe book. Online reviews are generally positive, although a few of them point out some odd quirks with this unit - which we'll cover. A little more expensive than the off-brand models, but still quite a bit cheaper than the top name-brands. A good mid-range price. While most of these griddles are open faced, this one latches shut and seals. It's got a long oval shaped cooking surface that's designed to give it more versatility with the types of food you can cook. 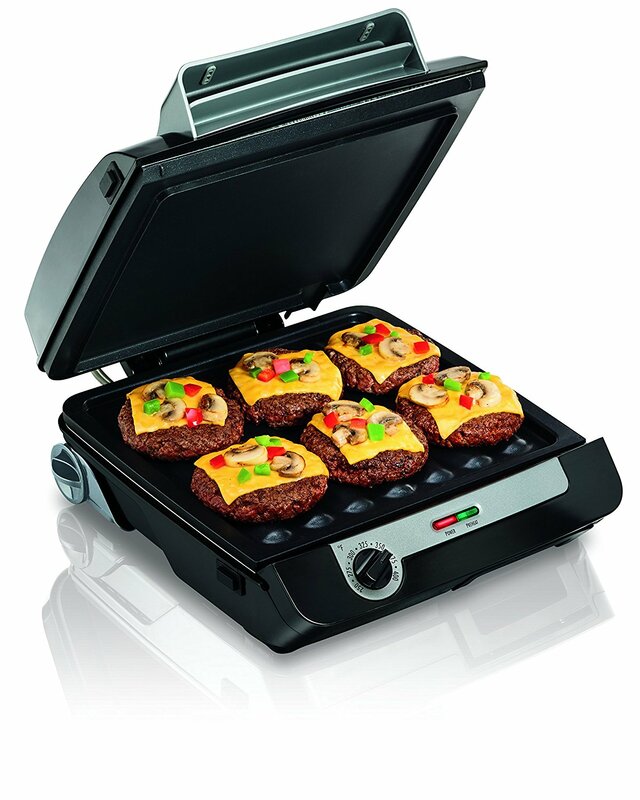 Unlike most of those "set it and forget it" grills, this has one extra step: midway through cooking, you flip it over. Since it's sealed, there shouldn't be any mess. But because you're cooking on both sides, food should be more evenly cooked. Too small to cook for more than 1 or 2 people. There are a few things you can learn by comparing it against the most popular alternatives. First, it's the most versatile of the options. It can be used for many different types of cooking, and doesn't restrict you to specific types of food. It's also one of the more affordable options on the list, with the exception being the Better Chef omelette machine, which can only cook eggs in one fashion. On the downside, it's not as spacious as George foreman, giving you a little less space for your food. And while it's ability to flip over is great for some kinds of food, it might not be so great for others. 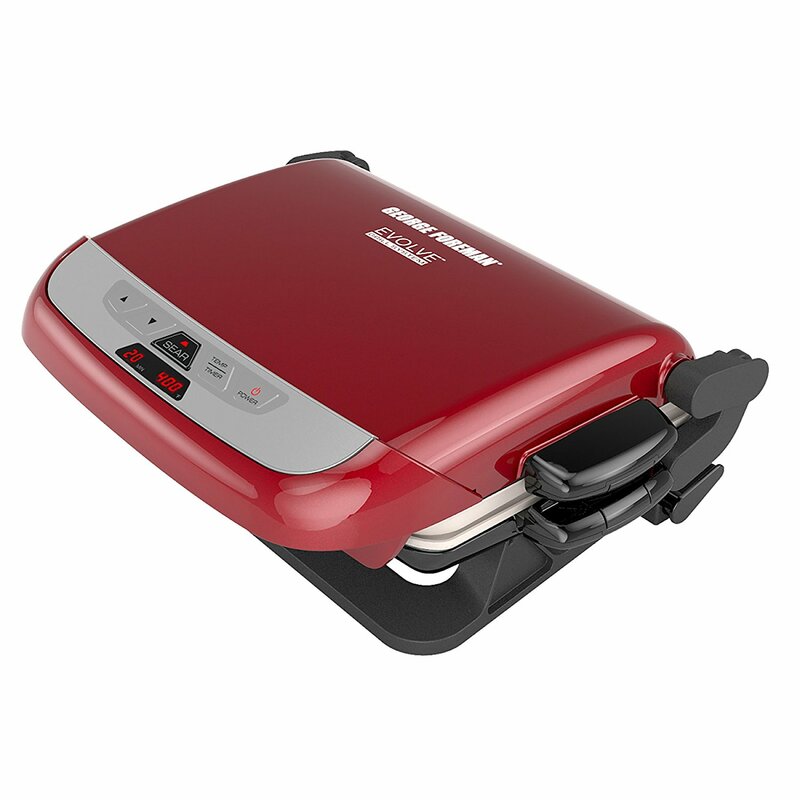 For now, let's go in-depth and see what this affordable little grill can do. Design wise, the company kept their red copper theme going so it matches their pans. It looks very much like a typical panini press, on with a much longer oval shape. There is a small latch on the top that allows you to look it shut, sealing the internal cooking area. you've got four rubber feet - two sets on each the top and the bottom - allowing it to sit sturdy when flipped. The top has a pair of LED lights, one red and one orange, that shows it's current status. Orange means that it's still heating up, while green means that it's up to temperature and ready to flip. These LEDs aren't always exact. If you are cooking something like a thick chicken breast, you'll want to cook it a little longer. The whole unit is enclosed in a pretty solid plastic. It feels durable and doesn't have a lot of play - something that we've seen with cheaper products. The latch also feels pretty solid. It's got a smooth range of motion, and it clicks into place so you know that you've got it closed properly. opening up the unit, you'll see two fairly deep cooking surfaces. These surfaces use the same highly regarded copper-infused non-stick coating, which we'll get into shortly. On the back, you'll find a small indentation which can be used as a grip. When it's time to flip it, you can grab the handle and this groove in the back. It's important you don't grab onto the sides, as it can get quite warm. 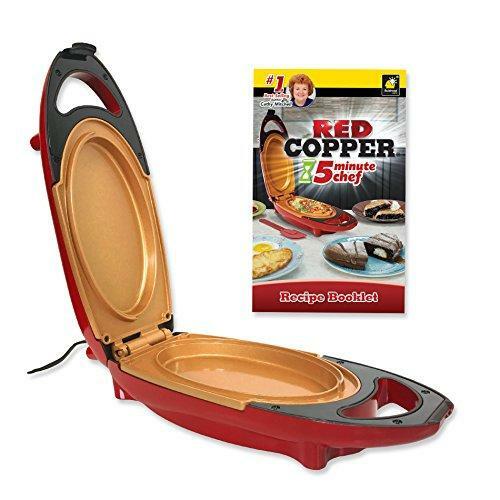 One of the key features - and red copper's claim to fame - is the non-stick coating on the ceramic cooktop. It's very similar to what you'd get on a Teflon pan, except PFTE ( the primary ingredient in teflon) has been replaced with copper. Copper is much more resistant to high temperatures, and is a better conductor of heat. But most importantly - nothing sticks to it. 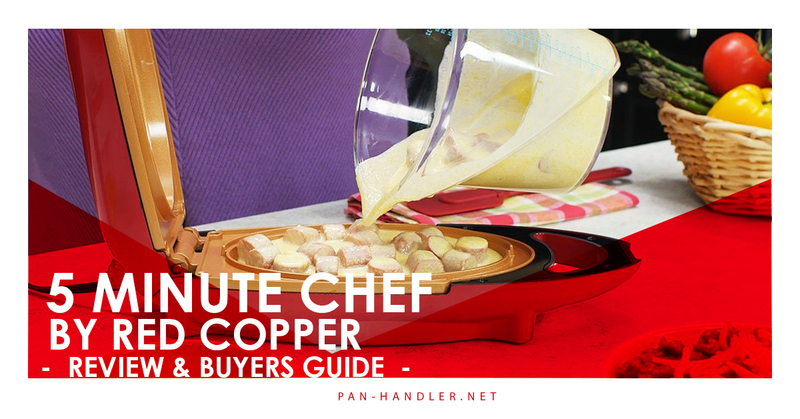 Just watch the infomercials for the red copper pan. 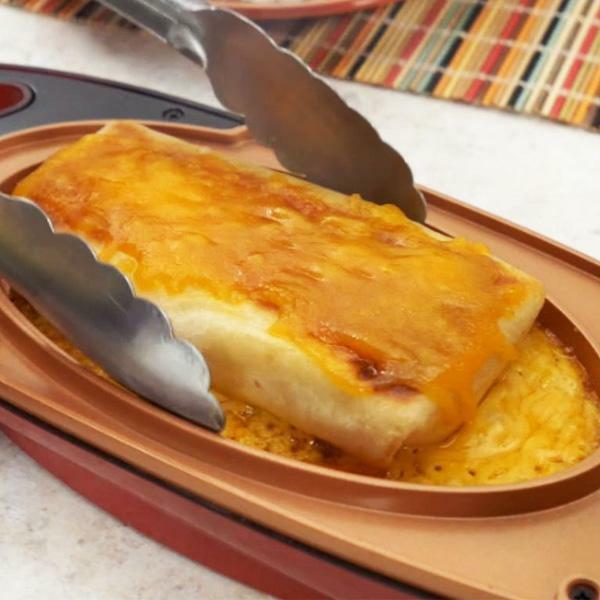 Food just slides right off, even if you don't use any grease. In reality, it doesn't work quite as magically as the commercials show. But it's still a significant improvement over a standard non-stick surface. In this case, there are a few key results. Ever cook a waffle without properly oiling your waffle maker? When you open the top, the waffle just tears into chunks - which you then have to dig out from all of those little crevices. With most of these enclosed grills, you'll experience a similar problem. Some foods stick more than others. If you're making an omlette, you'll find that the cheese makes a huge mess. But this is a non-issue with the 5 minute chef. You just open the top to find a perfectly formed oval of food. No sticky mess, and very little cleanup. Once your food is done, you simply wipe it down with a dry cloth and put it back in the cupboard. Easy peasy. Another interesting thing about the functionality of this unit is the fact that it has two elements - one on each the top and the bottom. 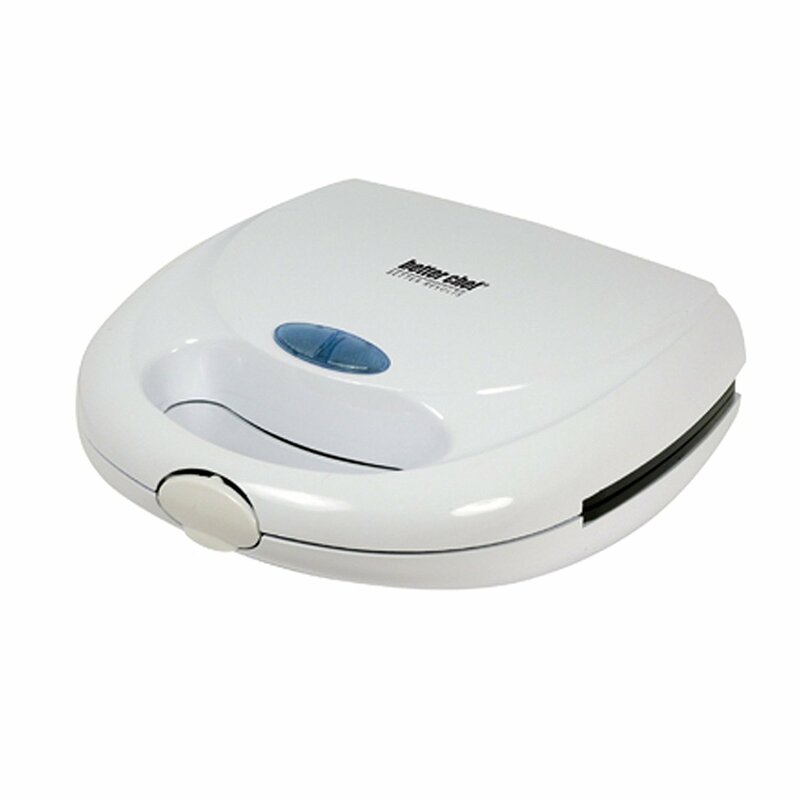 This allows it to cook food evenly from both sides - a major advantage. But that begs the question: if it's cooking on both sides, why do you have to flip it over? It's simple. Even though the copper coating makes the non-stick surface perform very well, it's not perfect. Just as you have to move your chicken around in a pan to prevent it from sticking, you do need to move the food around in this little guy too. But since it's sealed, you're not going to get a spatula in there. So what they do is have you flip it half way through. For the first half, the food is pressing down on the bottom. After, it's pressing on the top. This relieves the pressure and keeps food loose, so you can simply pop it out of the grill once it's done. To test it out, we tried a couple of different meals. The 5 minute chef comes with a handy little recipe book, so we figured it would be best to start off with something from there. To start with something easy, we decided to make an omlette. We whisked eggs, milk, and cheese together - then added some mushrooms, peppers, and kale. After plugging it in, we waited about 60 seconds for it to warm up. We then poured our mixture in, and let it cook. It took about 3 minutes before the light turned green. We then flipped it over, and waited another 2 minutes. We opened it up, et voila. A perfect omlette. Granted, presentation wasn't exactly what we were used to. Our omlette was a perfectly rounded oval, but still tasted delicious. 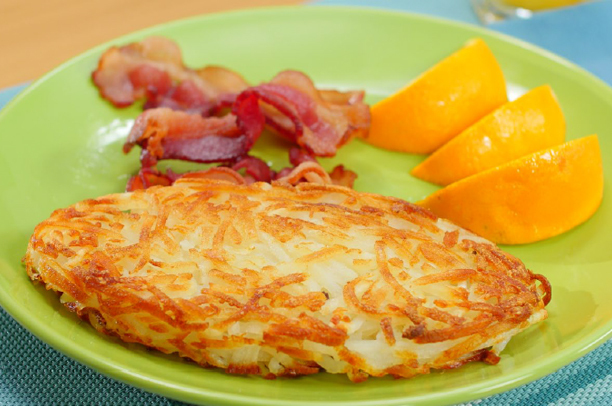 It only took a little prod with a fork to get it to slip right onto our plate. Just as we found with the red copper pan, cleanup was extremely easy. Next, we decided to try something a little more challenging. We made some dough and portioned out three little tea biscuits. We placed them on the 5 minute chef and waited for them to cook. Time wise, it took just as long as it would have in the oven - about 25 minutes. But they turned out perfect: golden on the tops and bottoms, and perfectly flakey and soft in the middle. So far so good! The next thing we tried (and believe us, we'd been waiting for this) was to bake a cake. According to the instructions, you should be able to divide a boxed cake mix in half. In our findings, it was more like a quarter. The cooking area was fairly deep, but it wasn't wide - so there isn't enough room for a whole cake. Granted, it was a fine portion for two people. We baked the cake for the designated time and tried it out. Unfortunately, it wasn't everything we had hoped for. The cake was still a little gooey in the middle, and didn't cook all the way through. Perhaps it isn't quite hot enough for baking such a thick cake, so we figure it's better to stick to biscuits. Overall, we were pretty impressed with the 5 minute chef. It's affordable, easy to use, and extremely easy to clean. It works great for any simple meal, whether you're making an omelette or grilling a chicken breast. Despite putting a lot of emphasis on speed, it's not really any faster than traditional cooking. If your recipe takes 20 minutes to cook, it will take 20 minutes here. Where the advantage is comes from the ease of use. Once you close the latch, you don't have to think about it again. Just wait for the light to turn green, and focus your time on other things. We'd recommend this to anyone who wants to make single portion meals, or who wants to use it to cook part of a larger meal. For those of you preparing food for an entire family, you're probably better off with more traditional methods of cooking. But if you really love this system, there is a two-piece package available.